Given the events of a decade ago, 2018 promises to be a year filled with reminiscence. Chroniclers will recall the signs of the gathering storm: falling U.S. house prices, rising mortgage defaults and spreading institutional failures. All of these led up to the crisis of September and October 2008, which nearly fractured the global financial system. I personally remember spending long, stressful hours at the Federal Reserve Bank of New York during that interval, trying desperately to arrest the negative spiral. If someone had told us then that the global economy would start one of its strongest expansions soon thereafter, we’d surely have thought them foolish. But that is the outcome we have enjoyed. Key policy decisions, made under immense pressure with limited information, proved to be astonishingly effective. 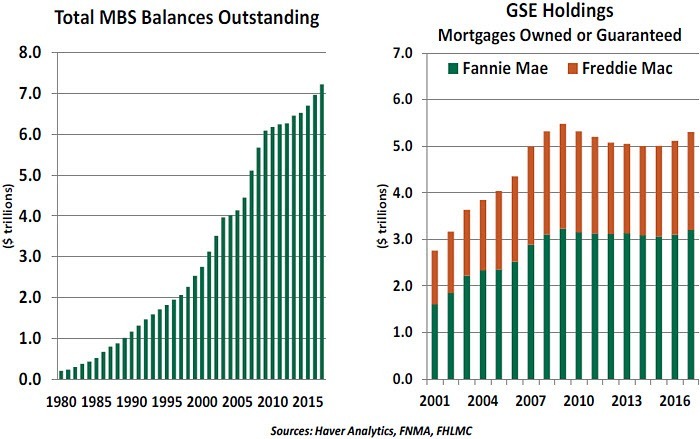 Most of the programs established to restore stability closed long ago, but one major piece of unfinished business remains: Freddie Mac and Fannie Mae, the government-sponsored entities (GSEs) that support the U.S. mortgage markets, remain under federal conservatorship. Obligations of Freddie and Fannie are held in portfolios around the world; the Federal Reserve, in particular, owns $1.8 billion of their bonds. As the future of these agencies is debated in Washington, a wide array of stakeholders is paying close attention. Residential construction is seen by many countries as a key economic sector, and promoting home ownership is a common economic aim. Fannie’s history dates to the wake of the Great Depression, when it was chartered to aid the flow of credit to the U.S. housing industry; Freddie followed in 1970 to further support the secondary mortgage market. But the GSEs did not come to prominence until the early 1980s, when investors developed a thirst for mortgage-backed securities (MBS). Basic MBS are simple: mortgages are pooled together and sold to investors. Payments made by homeowners are passed through to the MBS owner. 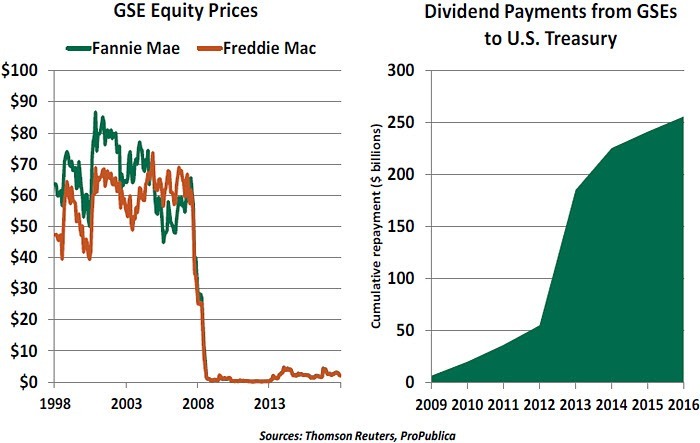 Freddie and Fannie provide a guarantee that bondholders will not lose principal, even if a homeowner defaults. This assurance was critical to the growth of the MBS market. Freddie and Fannie had an unusual structure. They had publicly traded stock, which benefitted from the rapid growth of the companies. But the two agencies also had a backstop from the U.S. Treasury, which was taken by many as a guarantee against failure. To critics of the GSEs, this seemed a little one-sided: if times were good, shareholders would gain. But under duress, taxpayers were at risk for losses. The companies and their congressional supporters deflected this criticism for many years. Even as Freddie and Fannie expanded their activities and their exposures, they were allowed to operate with very small capital cushions. This proved fatal when the bottom fell out of the U.S. housing market. In August of 2008, after months of mounting problems, the U.S. government was forced to place Freddie and Fannie into conservatorship. The form of the transition was carefully designed; had the companies been taken through bankruptcy, the value of the remaining guarantees would have been deeply devalued and the prices of mortgage-backed securities (and derivatives based on them) might have entered free fall. Ultimately, the federal government injected a total of $187 billion into Freddie and Fannie to keep them alive. Under conservatorship, all profits earned by Freddie and Fannie are remanded to the U.S. Treasury. The economic recovery has made that an especially attractive proposition; since 2009, the two companies have generated $271 billion in profits. Like other crisis-era programs, the assistance forwarded to the GSEs has proved incredibly profitable for U.S. taxpayers. The addiction of Congress to that income stream has diminished the urgency of finding a long-term solution for the firms. Nonetheless, conservatorship is growing uncomfortable. The tax reform act will discount the value of deferred tax assets held by Freddie and Fannie, likely prompting them to ask the Treasury for a cash injection. This will remind Congress and the public of the agencies’ continued dependency, and could accelerate calls for resolution. In addition, the stockholders of Freddie and Fannie have filed suit, claiming their rights were abridged. (Since the firms could not be placed into bankruptcy, the shareholders may have a case.) And some in the private sector would like to compete for the opportunity to underwrite and guarantee mortgage-backed securities. rates could consequently end up higher under this design, and capital to the sector could be more limited. A thorny question that will have to be addressed as part of any transition will center on the treatment of existing MBS. Will they continue to be guaranteed exclusively by the government, or will their coverage transition to private hands? The decision on this front could have an important effect on the value of securities outstanding. Some continued public role in home finance seems inevitable, given the perceived importance of the industry to the domestic economy and the difficulty of making a clean break. What is less clear is why two companies are needed to fill this role; Freddie and Fannie still compete with one another, despite their common ownership. In an effort to create some momentum behind reform, Treasury Secretary Steven Mnuchin has threatened unspecified executive actions if legislation is not forthcoming. But political and public urgency is simply not there. The last vestige of the bailout era may remain with us for years to come. City living is booming. 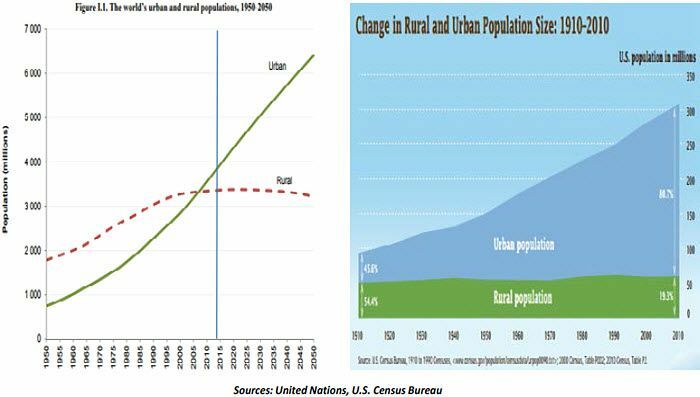 Whether government-directed or voluntary, the urbanization of populations will have an important effect on local and national economies in the decades ahead. This was among the topics covered at the recent World Economic Forum. The motivations for this trend are simple. Employers want to locate where the local labor pool can meet their current and future talent needs, while employees seek to live in places where they can find work. This symbiosis leads to a snowball effect within successful cities. In the most dynamic of them, clusters of similar businesses create ecosystems of labor, employers and vendors. The revival in urban living can bring many benefits to city dwellers. Dense housing makes better use of environmental resources; public transit and ride-sharing have reduced the need for people to own private cars. Those with the fortune to live near their employers have the luxury of walking to the office or using company-provided transit. In cities, social and entrepreneurial opportunities are ample. The presence of large populations fosters the development of cultural institutions, service businesses and community organizations. Taken together, these elements create a quality of life that has proven attractive to both younger professionals and retirees. Nevertheless, the competition for critical mass has led cities to offer financial incentives for employers to relocate or expand in their jurisdictions. (The derby surrounding Amazon’s search for a second headquarters city in the U.S. illustrates this phenomenon well.) Every job created has a multiplier effect: New residents will buy homes, eat and shop in their new communities. However, the rich incentives being offered strain the threshold of plausible value and put further pressure on stretched municipal finances. Real estate development is another challenge, as growing communities need to provide housing for both their industrial leaders and the rank-and-file. Cities not favored by firms or workers face residual challenges. Some “rust belt” areas have struggled to sustain themselves and their populations as talent and employment migrate away. This contributes to income inequality, populism, and the risk of insolvency. There are presently 28 cities in the world with populations of over 10 million, 20 of which are in developing countries. Some of these mega-cities struggle with basic municipal services such as sanitation and policing. Scale isn’t always a good thing. The urban revival presents great opportunities to urbanites, employers, city planners, and developers. But density has its downside. Careful planning and coordination will be critical to sustaining the health of the world’s cities. After a decade of turmoil, Greece is now showing signs of life. Two years ago, there was discussion of the country exiting the eurozone. Today, Greece is working towards exiting the support program provided by international financial authorities. On the economic front, Greece’s economy has grown for three quarters in a row, forming its longest expansion in over a decade. This is mirrored in the fiscal data, which shows the government running a larger-than-expected surplus. 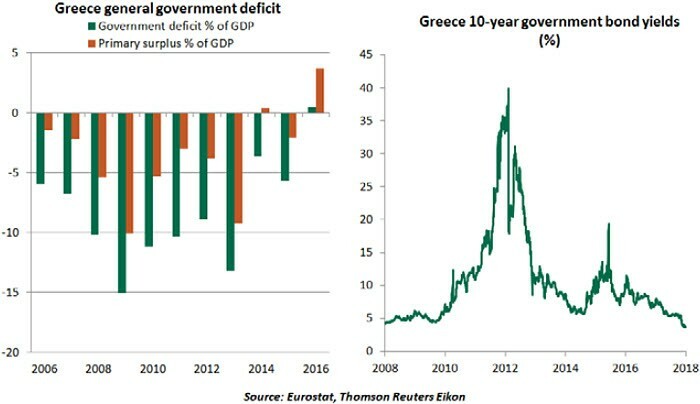 Notably, Greek government bond yields have declined to their lowest levels since the onset of the crisis, boding well for the imminent sale of new debt. This, in our view, will send a strong message that Greece is back, and raises the possibility of a Greek exit from its bailout program in August. European Central Bank) have been reluctant to accept write-downs. Though Greece is now in a better position, progress on required actions and reforms will hold the key to future progress. Government debt still stands close to 180% of gross domestic product, double the figure of aggregate euro area. Required asset sales have faltered recently; these were part of the privatization scheme recommended by the European Union and the IMF. The European Commission expects that by the end of the program in August, the government will fall short by around €3 billion from its initial target of asset sales. Further, Greek banks continue to remain burdened by a large volume of non-performing credits, accounting for 45% of total loan books. And structural reform of Greece’s labor markets and tax system may take years to complete. While bond investors are giving Greece a lot of credit, it may be the result of a reach for yield as opposed to true confidence in the country’s trajectory. The turnaround in Greece has been impressive, but there is still hard work to do.